The Amazon basin isn’t all a lush tropical forest. 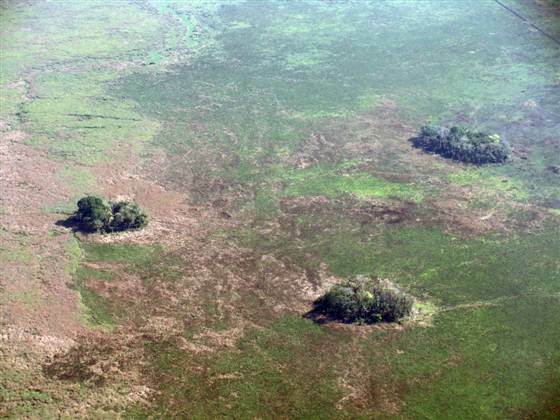 In large portions of western Amazonian wet seasonally flooded grasslands – not trees – are the norm. The upper branches of the Amazon River wind themselves across massive flood plains like snakes writhing across a sandy surface. One feature of these nearly featureless flat plains that has long puzzled visitors is the presence of hundreds of small forest islands. These 50 to 200 foot diameter forest islands found in a sea of grass and marshes sit only one to three feet above ground level. That small elevation change is just enough to reduce the water content of the soil to support tree growth. But what is the origin of these small mounds? Rocks are virtually unknown in this part of the world. Could they be ancient termite mounds or the result of animal burrowing? Or could they have been intentionally built by native South Americans much like some of the famous Native American mounds found in North America? For some forest islands, the answer is apparently: none of the above! An example of forest islands on a flood plain in central Bolivia. These islands had been thought to have formed from natural (non-human induced) processes but now some have been shown to be the result of human activity. Research published by PLOS One (Early and Middle Holocene Hunter-Gatherer Occupations in Western Amazonia: The Hidden Shell Middens) on three island mounds near Trinidad, Bolivia yielded some surprising findings. What the investigators found is that when they dug into these mounds they discovered they were composed of massive numbers of snail shells, bones of various mammals including human bones, and fire-blackened soils and bones. That humans were involved, even if not in deliberate way, in the production of these mounds is of little doubt. Evidence of human influence can be seen in the millions of snail shells that are mostly missing their opercula which would have been present had they died naturally and deposited here. Bones of game animals and evidence of deliberate fire point to these sites as being locations were people brought prey and other food sources and prepared them to eat. How might the mounds have formed? Armed with the observation that the bottoms of the mounds contain massive numbers of snail shells, it is hypothesized that shells were deposited here for some time. As they accumulate the spot attracted more attention which then brought more activity which accelerated the accumulation of mound material A positive feedback loop developed where the “island” became a place to come in high water times and eventually because it provided the cover of trees which probably weren’t originally on these mounds. The formation of these mounds is then not suggested to be the result of any intentional design, such as some form of landscape engineering that would be done thousands of years later in the same region where ditches and hills were built to control the wetlands by later pre-Columbian dwellers of this area. Rather the mounds came about by an accidental, yet human induced, series of events. 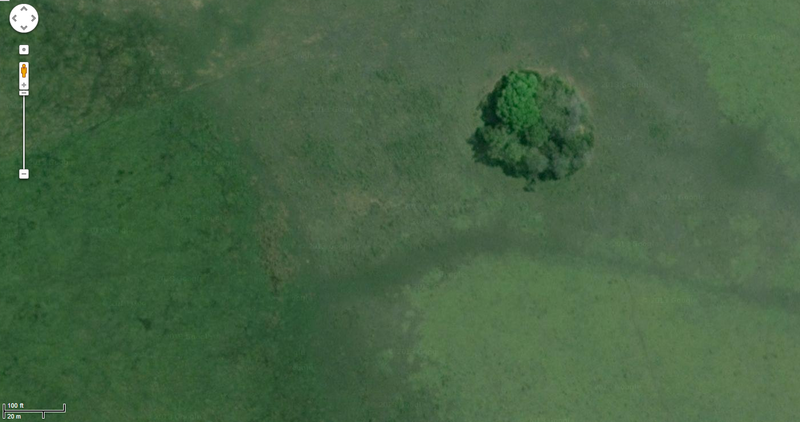 I took this screenshot of Google maps showing the possible identification of study site forest island SM3 from Bolivia. Toward the left side near the road there is another smaller forest island. The remainder of the light and dark greens here are grasses and aquatic plants. 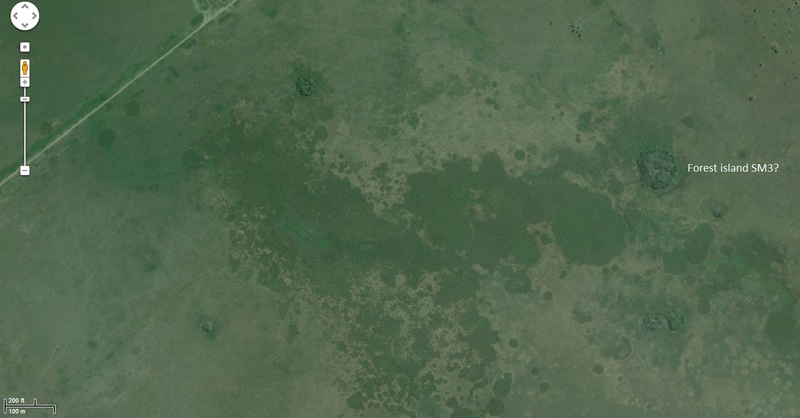 I could identify more than 20 similar looking mounds in my short search of the areas using Google maps/earth. Forest islands suggest a long chronology of human habitation. How old are these mounds of shells and bones? Data from these mounds gives us some clues. Cores into the mounds were dated from top to bottom and it was found that the oldest material on the bottom dated to around 10,000 years. I’ve written a series of posts about how context is key to understanding chronology of human remains (See The frequently overlooked geological context of hominid fossils and Implications of artifacts and bones on ancient human butchery practices and Geological context II: Neanderthals and the Italian supervolcano. Context is no less important here either when one considers how old these mounds must be. Claims of radiometric dating are often ignored by creationists who believe archaeological sites such as these must be very young and have been produced in a very short period of time. But an examination of the evidence from this site reveals that these mounds speak to a long history of occupation by humans in this portion of the South America. Let’s look as some of the data more closely to see why this must be. I searched on Google maps and found the location of forest island site SM1 from the Lombardo et al. 2013 paper. This is a screen shot I took of that site from the Lombardo et al. 2013 paper describing the formation of these islands. On the left is a marsh/lake area and to the left are high grasses. The island itself only sits about 2 feet above the area around it but that is enough for trees to find a home there. Figure 1 from Lombardo et al. 2013 PLosOne paper. This shows the forest island SM1 which I have taken a screenshot from Google maps below. the forest islands (SM1 which is pictured above in my screenshot from Google maps) that was examined in detail. The researchers dug a pit near the center, making close observations of what they found as they dug down until this hit groundwater level (about 6 feet). They also took core sections from the mound and then further out from the mound into the grassy plain. In figure 3 below you can see what they found. This massive mound about 200 feet in diameter is composed millions of freshwater shells that extend more than 6 feet below the current ground surface. The figure shows that this mound must have sat on a flat land that was once much lower than it is today. Sometime after the formation of most of this mound, floods in the area deposited around 6 feet of new soil around the mound. Figure 3 from Lombardo et al. 2013. This presents a cross-section of the island (shell midden as they call it) that is pictured in the figures above. How does this progression of the mound and the new layers of soil impact our understanding of the chronology of human occupation? Well, the other thing we learn from this paper is that in the very top layers of the mound there are pieces of pottery and other cultural items that speak to the presence of more recent occupation. How recent, well the radiocarbon dating suggests 4000 years to the present but these cultural artifacts are still the types of things that archaeologists and anthropologists would consider signs of very early developed societies in South America. Below these relatively young (4000 years or less) layers of artifacts are evidence of more primitive hunter-gatherer groups which probably used these sites as seasonal locations to hunt from and collect any other food sources. The size of the mounds and their composition of millions of shells suggests a very long period of occupation (thousands of years). The types of animal bones and shells tells us that the environment was considerably drier than it is today. At some point probably after the hunters and gatherers had disappeared from this area other people moved here and these mounds would have become natural places to gather and cook food. Even this was probably thousands of years ago as evidenced by the radiometric dates and the evidence of a climate that was different from today. Then floods brought in many feet of new soil and the area changed into the marshy wetlands that they are today and the mounds became the only sanctuary where trees could live making this forest islands that we see today. The current “modern” soil that envelops these mounds is likely hundreds to thousands of years old itself. Once again the facts and the context of this archaeological site defy typical creationists explanations. Creationists propose to compress all of these human occupation sites into a chronology that spans only 4000 years. Explaining these developments of these mounds is a tremendous challenge to that chronology. And it is made even more difficult by the fact that the ground that lies below these mounds is likely composed of hundreds and hundreds of feet of sediments from floods of earlier times that must also be compressed into a post-Noahic flood world. In the creationist’ chronology there was an ice age 400 years after the flood and it was only during that time that people first migrated from the Tower of Babel across the globe. They traveled up across Alaska and then all the way down into South America. They then populated this region and ate millions and millions of snails forming these large mounds which then became partially buried by a flood of new sediments on which the “newer” civilizations of ancient South Americans then lived thousands of years to present. For anthropologists these landscapes were thought to have been one of the later locations to have been occupied by human immigrants. With so many other environments more suitable for human occupation, one would not expect that the very first people to arrive in South America would immediately take up residence in this area. There are many other location in South America that have been identified as being inhabited much earlier than 10,000 years ago. The discovery of these mounds are of human-induced origin shows that there could have had a sizable population in this part of South America many thousands of years ago. Result of observations of only three easily accessible forest islands are available thus far. 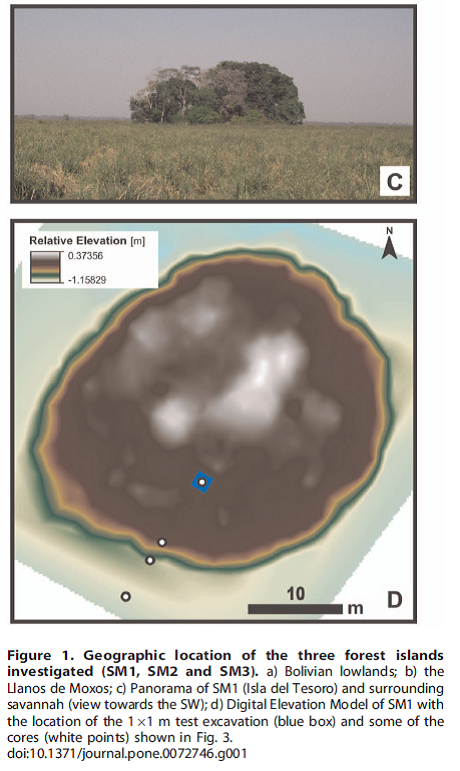 The paper does not indicate if other mounds have been tested but satellite imagery suggests there may be hundreds of similar mounds in the region. If most should prove to be composed of mounds of disposed shells and bones then the sheer number of shells alone would require a population of hundreds of thousands over a short period of time or these sites developed over thousands of years by bands of nomadic hunter-gathers. The former is unlikely given that such large populations would have been unsustainable given the resources available and lack of technology to manipulate the environment. The most reasonable conclusion is that these mounds are the products of thousand of years of development which fits the radiometric dating and other observations. As I have said many times before, when specific sites of human occupation are examined in detail the data tell a story that is consistent with long periods of occupation in which the occupants developed technologies slowly over time or were replaced by different people groups with new technologies. Creationist’s explanations must compress the development of these occupation sites into a very short time frame and typically ignore the evidence of changing technology and other cultural advancements (art, writing, etc…).